Western Vs Vedic - 4. So, 4th difference is Divisional Charts. In Western Astrology, there is only one chart/horoscope to look at and predict from, that is our main birth chart/horoscope. A Western Astrologer, predicts everything from that one chart and yearly planetary transits. But in Vedic Astrology, apart from the main birth chart, there are about 15 more charts, so in total there are 16 charts to look at. That's why it is called Shodashvarga Charts. They are called as D-1, D-2, D-3 etc. where D stands for Divisional Chart. So, What are these Divisional Charts? Suppose, your birth chart indicates your career as being a professional in medical field, but then it is confusing, because medical field is from being Nurse to a medical store owner or a pharmacist or a Surgeon or head of a huge hospital. What you will be from these people? Well, for this you need to see your Dashamsa (D-10) chart of career which will pin-point at the exact career you should pursue. So, for career, you not only look at 10th house (work environment) and 7th house (business/market place) of main birth chart but you also need to see D-10 (Dashamsa) chart, which is exclusively meant for career. How Divisional Charts come into existence? As per my little knowledge about manually preparing of horoscopes, divisional charts come into existence by looking at various planets in various nakshatras in birth chart and thereby taking a place in a particular divisional chart. For Ex. if Sun is in Shravana Nakshatra at certain degree (say 23*), then it will be placed in the 1st house/Ascendant of D-9 (Navamsha Chart). 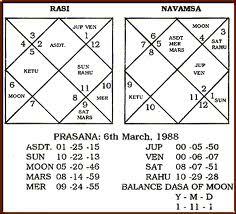 So, actually, in a way, if we consider Nakshatra and degrees of planets in birth chart itself then we need not to look at Divisional Chart, because Divisional Charts are made on the basis of planets at a particular degree and particular nakshatra at birth chart. Following are 16 Divisional Charts (including main birth chart), their names and main portfolio they hold. D-1 - Main Birth Chart. Also called as Lagna or Ascendant Chart. It remains the most important chart because on its basis we make divisional charts. D-2 - Hora Chart - Signifies the Wealth a person may acquire in his life. D-3 - Drekkana Chart - Relationship with Siblings. D-4 - Chaturthamsha Chart - Your Luck, Possibility of fixed assets. D-7 - Saptamsha Chart - Timing of having children. D-9 - Navamsha Chart - Timing of Marriage and happiness in married life. D-10 - Dashamsha Chart - Kind of career a person might have. D-12 - Dwadashamsha Chart - Relationship with Parents. D-16 - Shodashamsha Chart - Possibilities of getting Vehicles. D-20 - Vimshamsha Chart - Religious or Spiritual Growth. D-27 - Saptavimshamsha Chart - Strength and Courage. D-24 - Chaturvimshamsha Chart - Education. D-30 - Trimshamsha Chart - Illness, Accidents and other misfortunes. D-40 - Khavedamsha Chart - Related with Auspicious Results in life. D-15 & D-16 - Akshvedamsha & Shashtiamsha Chart - General and overall well being. Among all the divisional charts, D-9 and D-10 are most important as they hold the portfolio of Marriage and Career respectively, two major things of this materialistic life. Another thing is that all 16 divisional charts co-relate with each other. We can easily find a link between them and as such, if you put 16 divisional charts of 1 person in front of a highly spiritual and intuitive astrologer, he/she will be able to tell you in few minutes that these are not 16 different horoscopes of different individuals but these are actually 16 divisional charts of one person.